From the Junction 8 roundabout of the M11, you take the Bishop's Stortford exit. This road will lead onto a second roundabout. On this roundabout take the first exit that takes you along the A1250 (Do NOT take the A120). Whilst driving the next 1/4 of a mile, you will see Bishop's Stortford Golf Course to the left and an industrial estate to the right, before you reach a small roundabout. At this roundabout, drive straight over it (second exit) and continue for approximately another mile until you come across a major road junction with traffic lights. During this stretch of road you will see lots of trees, go over a railway bridge, Nags Head Pub (left) on a sharp bend bearing right which you follow, Used car Sales Garage (Left), Land-Rover Garage (Right), mini-roundabout, Hockerill School (Right) and formerly the Red Cow Pub currently under renovation (Left). When you reach the crossroads with traffic lights (you will be sloping down hill slightly at this point), you need to take the left. Turning left takes you onto the start of London Road, you keep following this road until you reach a mini-roundabout. As you drive along you will see a launderette, SUDS on the right, ALDI (Right), Three Tuns pub (Right) and a Volkswagen Repair Garage (Right). 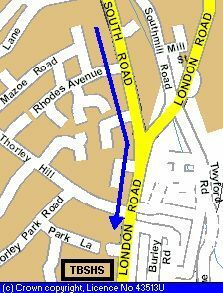 At this round-about London Road does NOT go over it, but continues RIGHT over the railway bridge. After you have gone right at the roundabout you will see Glow IT/ITVet to the left, the Baan Thitiya Thai Restaurant on the right and then finally Shell Garage (right). When you get to the Shell Garage, you continue in the same direction that you have already been driving, for a further 1-2 minutes. This means at the Shell Garage round-about, you take the first exit and continue following London Road. As you drive along this road you will see: Dawns Stores (Right), Traffic Lights with a post box, Mitre Gardens (Right), Pedestrian Crossing (Traffic Lights) and then The Bishop's Stortford High School entrance (Right). The entrance to the school is in a tree-covered section of the road. If you reach another major junction with traffic lights on it, you have gone too far. When you get to the entrance of The Bishop's Stortford High School, you take the right hand driveway up to the reception area. You can hire a taxi from the station concourse to the school or take a delightful 20 minute walk. For those walking, from the front of the station you stride out along the road that exits the front of the station. This road runs along side the big station car park. At the end of the car park, (the Falcon Pub will be across the road), you turn left and start to head towards the town. You will go past a number of bus stops, the Rose & Crown Pub on your left, then over a bridge crossing the Stort Navigation Canal and past a number of small shops including Mains Electrical Store. All of the time, the cinema will be on your left. As you walk past 'Mains', you will be able to see a set of traffic lights at the point where the road goes left towards the Post Office, up the hill or right into town. At these lights, you will be outside the 'Thai Rack' and follow the road round to the left. Now you walk along South Street for about 15 minutes. It is recommended when you get to the road crossing near the post office, that you cross over to the same side as the Post Office. Some of the buildings that you will see along the way will be: Thai Rack (left), Post Office (Right), Kwik Fit (Left), Jolly Brewers (Right), Bowling Green (Right), Rhodes Centre (Left), Garden Nursery (Left) and finally Shell Garage (left). When you get to the Shell Garage, you continue in the same direction that you have already been walking, for a further 5 minutes. This will take you past the roundabout and at this point you will join London Road. As you walk along this road you will see: Dawns Stores (Right), traffic Lights with a post box, Mitre Gardens (Right), Pedestrian Crossing (Traffic Lights) and then The Bishop's Stortford High School entrance (Right). The entrance to the school is in a tree-covered section of the road. The airport is served by a number of European Airlines as well as some internal UK Domestic services. Travellers from the USA can only travel directly to Stansted Airport with Continental Airlines. There are regular coach services from London Heathrow and Luton Airports for those that are not able to get direct flights to Stansted itself. Travel from the Airport to the school is possible by TAXI and/or HIRED CAR. Exits to the Bishop's Stortford/M11 interchange are clearly marked and should be followed, but without actually going onto the motorway itself. Travel from the Airport to the school is possible by TRAIN. Travellers need to make their way to the Train Station which is situated underneath the main Airport building concourse. 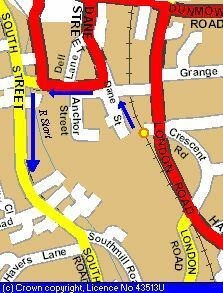 The MAJORITY of Stansted Express/Flyer train services to London (Liverpool Street) stop at Bishop's Stortford station (6 minute journey).